Occasionally from time to time I spend a few hours looking for new arches in different places likely to have them. Here in the Alabama Hills I found 2 of them and not sure if anyone has seen them yet or at least the average photographer. The first photo in this series is one of them. The other one is pretty hard to get to and you have to climb a little but it might have some good potential if the roads don’t ruin the view. I’ll have to see next time I’m out there. On a separate trip while zooming into a snapshot of one arch I took from the road I found another on top of the boulder piles, even with it’s location in sight, it is still hard to find because you loose your depth perception as the walls get bigger and your surroundings enclose on you. It’s no doubt it takes time to find these unknown arches. I’m really curious if anyone ever really spends the time trying to find them or is it just common practice to wait for someone else to direct them to these arches. I’ve driven the roads and spotted some of them from the roadside but now there was about 4 well known arches Mobius, Lathe, Heart and Whitney Portal arch. In recent years Cyclops and Lady Boot arch have become very well known. Cyclops is shown below with the rainbow. Does anyone feel that any of new found arches should be kept hidden or revealed? 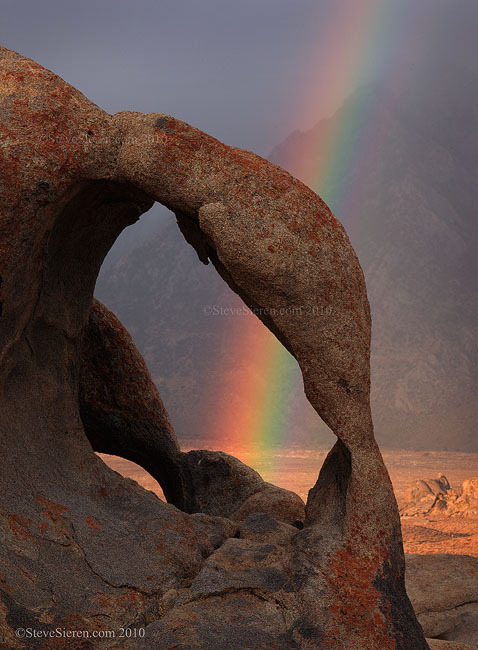 I asked David Muench where his famous Kissing Meercats arch in the Alabama Hills was and he politely said it is so fragile that he cares enough not to reveal where it is, before asking him, I kind of thought he better not tell me. I didn’t beg and say, “C’mon, I won’t tell anybody!” I really respect that he didn’t tell me because it just encouraged me even more to do my own explorations. When a place is mysterious and full of unkowns the build up to exploring it is a giant lure for me as a creative photographer. 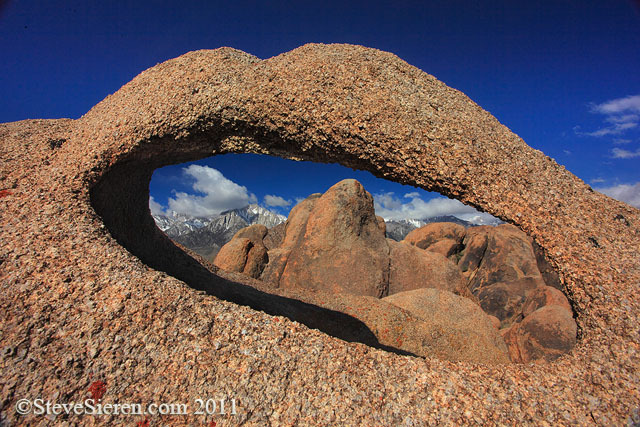 Does anyone have any feelings on what they think the future of the Alabama Hills and it’s many unknown arches? David, wants it to become a protected monument, it’s one of his favorite places. It’s likely in the future there may be a handout with about 25 arches sometime in the near future. Some are fragile and some are not, do you feel this would hurt the environment or not? Here is an arch off the beaten path at Joshua Tree National Park. I don’t think it’s location will be popularized because of the difficulties getting to it, from certain directions at least. This entry was posted on October 20, 2011 at 11:38 am and is filed under Uncategorized. You can follow any responses to this entry through the RSS 2.0 feed. You can leave a response, or trackback from your own site. I haven’t photographed the arches there, but I find the place fascinating, and its combination visual interest and beauty, its location along the route to Whitney, and some historical aspects make it a prime candidate for protection as a national monument or park or similar. I’m not sure concealing the location makes any difference other than to the individual photographer. 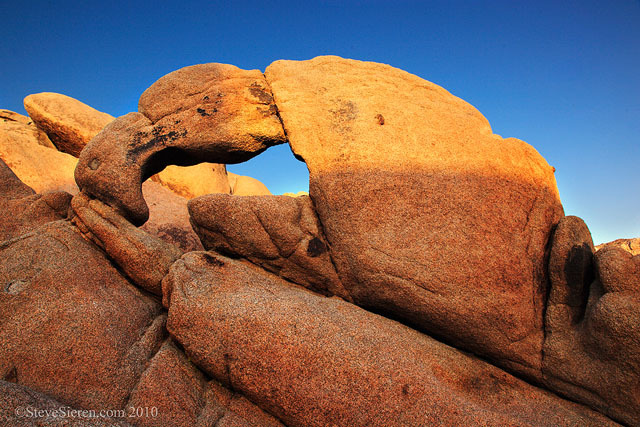 There are ample resources available to track down arch locations in the Alabama Hills. It’s not a wildly difficult place to trek and explore in regard to remoteness. I’ve posted about the popularity of photographing Mobius arch several times. The BLM isn’t too concerned about it as in the past couple of years they’ve created well marked path to it and Lathe arch. Clearly I think that all locations are subject to risk whether openly discussed or not. Yes more people may seek out these locations, but the deeper into the Alabama Hills the least likely it will be someone who visits that has a true intention of harming the formation. Just my personal take anyhow. Dan, thank you for commenting. It’s a surprise to me you haven’t photographed the well known arches but then again you don’t seem to be the photographer shooting all the icons. The hills are a beatiful place and seeing them protected woudln’t be a bad idea. There is or was a condo project in the works very close to the boulder piles near Portal Road. Great post Steve (ironically, I was just there yesterday morning!). I’ve been to Mobius/Sunrise/Noname arch many times over the years and only now discovered the trail! Part of the reason for this is that I don’t seek out the tourist info, but always prefer to wander and discover on my own. Same pioneering spirit I take with me in the mountains. I agree with David that this wonderful place should be preserved (much as Manzanar finally was) and I think that sometimes less is more – especially when it comes to the disclosing of delicate sites. Jim, thanks for sharing your thoughts on the subject. Many of the arches are big enough to be walked or climbed on. David showed me a picture of the arch mentioned above. From the photographic angle that shows the Sierra as a backdrop through the arch it looks pretty thick but he had another from above where it looked almost paper thin and wouldn’t hold a person’s weight without possibly breaking the arch. I think it’s the fragile items that should be protected in one way or the other. Do you have a link to your post Mobius? Hey Steve: I’ve stopped counting how many arches I’ve found in AH. However, I don’t find many of them particularly easy to compose and many are not terribly photogenic. Great catch with the rainbow! Good thought-provoking post Steve! It reminds me of the situation with ruins in the southwest. In this day and age, even if you don’t disclose a location, someone eventually will. There are definitely dangers to the resource, but it also damages the joy of exploration and discovery. For instance, there’s a notable ruin in Utah that I looked for for a quite a while, but once I saw its location posted on the Internet, it lost its fascination for me. I know that no one has to look at the guidebooks and websites, but somehow knowing they’re out there is discouraging (as is the prospect of finally finding the place and being there with someone who just uploaded the coordinates to his GPS). I’m not secretive about the locations of my photos, but I don’t like to give detailed descriptions either. I hope that my photography inspires people to explore and find places they’ve never heard of, not to look for the exact same views they see on my web site. Thanks for showing me that arch in Joshua Tree. Its a hard one to find. It seems like Terry and I are always wandering off the beaten path when out shooting in those “iconic” places. I’m glad that a lot of photographers keep those unique spots hidden…makes the hunt for the image more fun. Stunning landscape with these arches. Great photos of them! Micheal, yes there are too many that are hard to compose and wedged in between rocks or up to where you can’t even set a tripod unless you have multiple ropes to add some kind of stablization for the tripod. Thanks for the links! Beth, no problem, it was like a maze getting to that one but still fun.